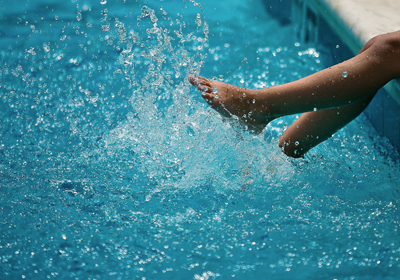 Now that summer’s here, many of us really want our kids to learn how to swim, so that they can enjoy the water and we can relax a bit more, knowing that they’re safe. But which are the swim lesson kids will really learn from, as opposed to those that you’ll just keep paying for, summer after summer? As a mom who’s signed up for (and paid for) three different styles of swim lessons, over the past three years, I thought I’d share what I’ve learned—and maybe save you a little time and money. From what I’ve seen, kids respond to the water in a wide variety of ways. But there has only been one style of swim lessons that actually taught anyone to swim: private lessons that took place over the course of 8 consecutive days. Now, before you think that your child will be the one who will not learn from this type of swim lesson, let me describe the three types of swim lesson styles I watched, and then you can decide for yourself. Believe me, if I had not watched my own daughter learn to swim, along with several other students of various ages working with their teachers, I would not have believed it myself! The whole process was very impressive. This was the first type of lesson I enrolled my kids in and, though it was fun, not much learning took place. It was more of a “Mommy and Me” style class where one parent (which, in this case was actually my husband, so it was technically a “Daddy and Me” class) plays in the water with the child, sings some songs, bobs the baby up and down and dunks his or her head underwater for a fraction of a second. The babies enrolled in these swim classes typically range in age from about 9-12 months. The goals of the parents are usually just to get their babies to enjoy the water and view it as a positive experience, rather than to actually teach the baby to swim (hence the quotes in the section heading above). There are probably other types of baby/infant swim classes, but my goal is just to provide an accurate description of my experience so that you can picture what you might encounter if you sign up for such a class. Since that was our goal for our daughter at the time, we deemed the class a success. I enrolled our daughter in group swim lessons last summer when she was 3 and a half years old at the Rose Bowl Aqauatics Center. My hope was that she would both have some fun and actually learn to swim. There were 8 students in the class and 2 instructors. The class met twice a week for 4 weeks. She had fun, but did not learn to swim. The instructors did their best to teach them to float on their backs and to get them to put their heads underwater and actually swim a few strokes out toward them. But because they did not get enough time with each student (that’s my theory, anyway), they did not make any real progress. In fact, I did not see much progress being made by any of the students in my daughter’s class, but I did see students in the higher level classes actually swimming. Where they had actually learned to swim, I don’t know. I do know, however, that the Rose Bowl Aquatics Center does offer private lessons, so that could be where the progress was made, but this is purely a guess on my part. Because I did not witness any swimming progress on my part by my daughter, or really by any of the students in her class, I did not think the class was particularly successful. However, she did have fun, so I didn’t consider it to be a waste of money. One thing to note: I did talk with a few parents in the bleachers and some were veterans of the group sessions, meaning that they had taken several in a row that year and had also taken some the previous summer. Their kids still could not swim. In my experience, these are the swim lessons kids will really learn from. Not only did my daughter learn to swim right before my eyes – by the 3rd day,—but I also watched a whole fleet of other students accomplish the same feat. The age range appeared to be about 2.75 years to about 6 years old for the first-time swimmers. The format was as follows: 8 consecutive days of 25 minute one-on-one lessons with the same instructor each day. Mind you, the youngest swimmers cried a lot for the first 3 days. They were not happy at all, but they were swimming successfully and safely by themselves by the 3rd day. By the 4th day even the youngest and unhappiest among them were jumping off the diving board. Yes, the diving board! And by the 5th day, all were very happy and proud swimmers, and all were sliding – head first – down a great, big slide! All of the instructors used the exact same steps, in what appeared to be the same order. They were kind, but firm with the kids about keeping their heads under water, kicking their legs, and using their arms to paddle. None of the kids were happy about this at first, but every one of them – even the very young ones who cried – got used to it and were very proud of their own progress. On the 5th day, they also practiced what the kids should do if they accidentally fell into the pool. The teachers would walk next to the pool, holding the child’s hand, singing “Walking along the pool! Walking along the pool! Ooops!” And then gently but firmly push the child into the pool. The child was instructed to immediately turn around, swim to the edge, and get back out. This drill was repeated about a dozen times under eagle-eye supervision, which I loved. If any of this sounds scary or difficult, let me note that each morning during the duration of swim lessons, my daughter would wake up and ask “How long till swim lessons, Mama? !” She would also plan which swimsuit she was going to wear that day, because she has two, and she wanted to alternate so that each swimsuit got a fair shake. As a parent signing your child up for swim lessons, you should really ask yourself what your goals are for these lessons. Because the private lessons were twice as expensive as the group lessons! But for us they made sense because they accomplished our goal of teaching our daughter to swim. To stay cool and occupy some time during the heat of the summer? To teach your child to swim and be safe in the water? To have your baby feel comfortable in the water? To bond with your baby and enjoy some time together with other Moms/Dads and their babies? I hope, once you know the answers to these questions, that the experiences I’ve shared about our family’s swim lessons will help you decide what’s right for yours. Good luck and happy swimming! Free Fun With Kids: A Popcorn Party! Been stuck indoors with crummy weather for one too many days? Here’s a way to have free fun with kids: throw a popcorn party right in your own family room! Festive hats optional. Free Fun With Kids: Plane Spotting! Lots of cities have figured out that it’s really cool to get an up-close view of planes taking off and landing so they’ve created parks for families to enjoy the view. Why not pack a picnic lunch and get in on the fun—it’s free! Discover Brainy, Affordable Fun With Discount Museum Memberships! Looking for reasonably priced adventures for adults and toddlers alike? You just might be surprised at how much your local art museum has to offer—and how much an annual membership can save you. Free Fun With Kids: Build a Fort! Looking for ideas for free fun with your kids? Do not underestimate the fort! You used to build them when you were a kid—out of just about anything you had on hand. Now it’s time to do the same thing with your kids. Cheap vs Expensive: Which is More Fun? Out of town guests arrive and you’ve got to entertain them. But which is more fun, expensive trips to local attractions and restaurants, or good old fashioned stay-at-home fun? Check out this Mom’s fresh perspective for some good laughs and helpful reminders. Budget Toddler Fun: The Train Station! Here’s a fresh idea for budget toddler fun: the train station! Lots of toddlers love trains—mine happens to be obsessed with them. Here’s a great way to make an afternoon at the train station fun and memorable for both of you. In the whirlwind of caring for babies and toddlers, sometimes we forget that we really don’t have to spend a lot of money to keep them happy and entertained.